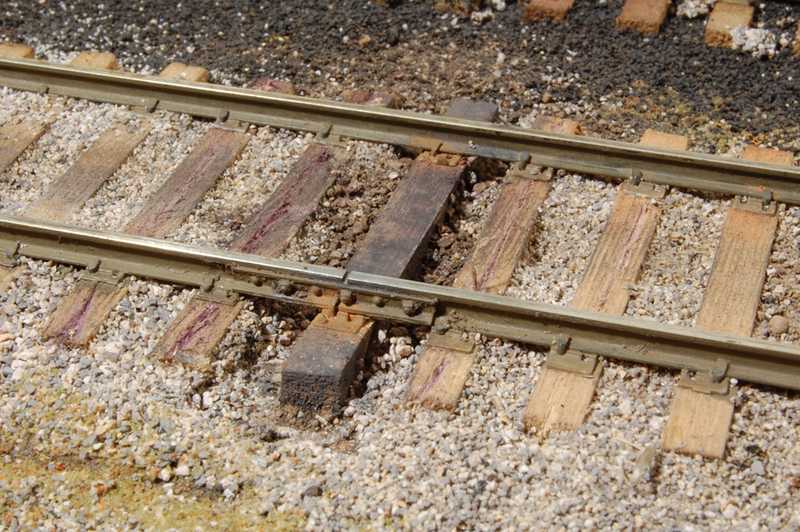 Detailing Track, Part 2: Modeling Ballast? It sounds simple. Spread some granular material along the track, tidy it up and bond it in place. That’s the extent of what we’ve been taught about ballasting track for decades. However, ballasting track is another opportunity to enhance the quality and realism of a scene. It’s a wonderful school that teaches the fine art of paying attention. As we know, ballast supports and stabilizes the track structure, while transmitting the wheel loads to the roadbed; and of course, it also provides the all-important drainage of water. The common choices for ballast are crushed stone or gravel, materials that drains well yet won’t wash away or erode easily. In the past slag, cinders, even sand were used. 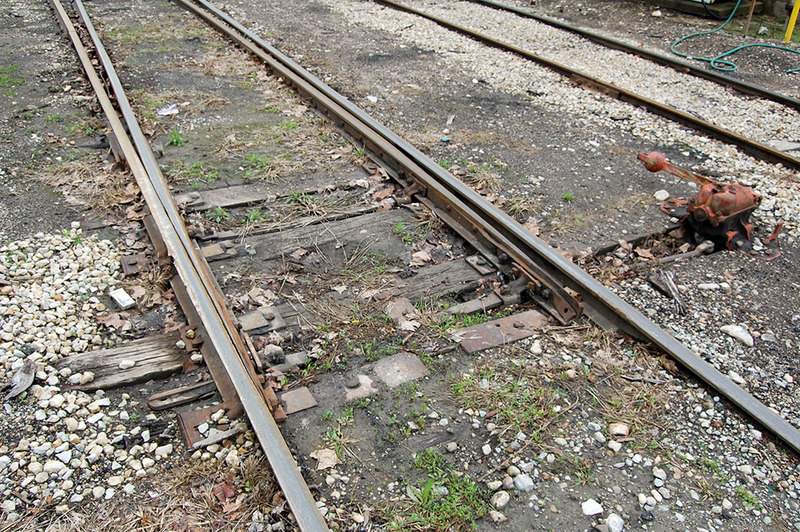 Early railroad construction used dirt in areas where harder material was unavailable or too costly. Clean crushed stone is the ideal, but unwashed pit run gravel has a high volume of stone dust, sand, even dirt particles, also known as fines, which can impede the flow of water, rendering it a second-class choice if washed stone is available. Even the cleanest ballast will suffer the infiltration of dirt from the roadbed, an accumulation of dust, cinders and ash from steam locomotives, coal dust and larger particles falling from trains and other debris. Weeds will root and eventually create problems if nothing is done. To maintain drainage qualities, ongoing maintenance is required every five years or so, depending on the volume of traffic and a particular railroad’s practice. Ballasting track is a wonderful school that teaches the fine art of paying attention. 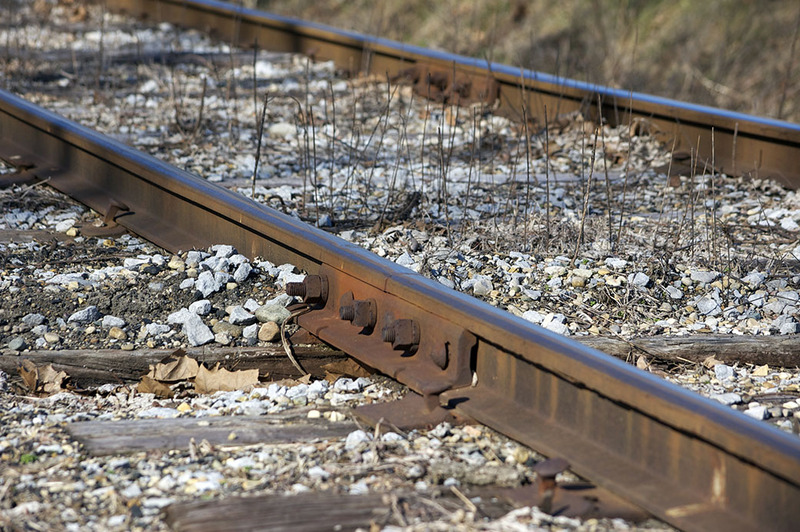 Clean ballast will get covered by fuel and oil spills, rust from the rails and tieplates, along with cargo spillage of all kinds. There are different ballast profiles between Class A, B and C tracks as outlined by the A.R.E.A in my digital copy of The 1921 Maintenance of Way Cyclopedia. 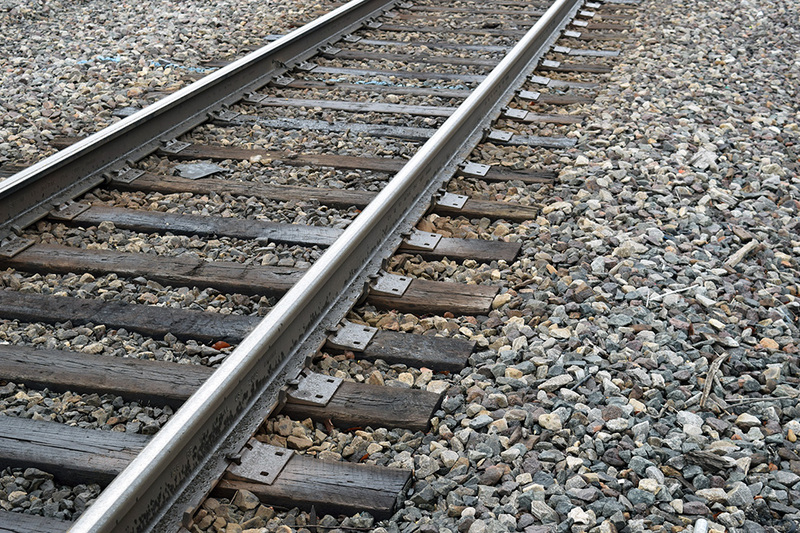 The ballast on Class A track is up to 12 inches or deeper if carload weights require it. The ballast will come to the top of the ties at the center with a slope of one half inch to the foot toward the ends, leaving the upper third of the tie exposed. The shoulders will have a 3to1 slope extending out around four feet from the tie ends for crushed stone. Other material like cinders will have a 2to1 slope outside the ties. Class B track has a ballast bed of nine inches with the same profiles. On Class C track, the stone bed is thinner still averaging out at six inches thick. These depths are maintained as consistently as possible but will vary according to changing conditions in the roadbed. With today’s longer trains and heavier car loads, the track bed may be much deeper on mainlines with heavy traffic and even secondary lines. Modeling these differences would provide a subtle touch of realism. A deep bed of crushed stone with a crisp profile supports this well maintained Norfolk Southern track. In addition to the color, I debated over the size of the granules, and finally chose the fine particles over coarser material. While this is very subjective, I felt the larger grains were too busy visually and detracted from the track. While I was satisfied with the track on the former layout, today I would look closer at full-size track and study the shape and texture of the ballast more deliberately because I feel there is plenty of room for improvement in my track modeling. Let’s take a look at different situations and the lessons we can learn. I chose the fine grade of Woodland Scenics ballast for the I&W. It looked better than the coarser material typically used in quarter-inch scale. Larger granules created visual chaos and the track all but disappeared to my eye. It’s a subjective choice to be certain. I made a mistake with the placement of the notch for the simulated rail joint. It should be between the bolts on the joint bar. Mainline ballast profiles are straightforward. Replicating secondary track is where the artistry comes in. 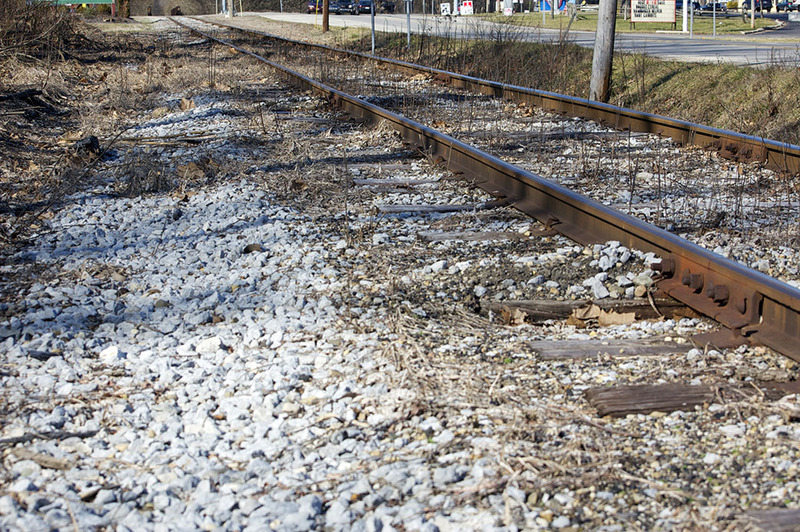 The I&O line south of Brookville, Indiana has been upgraded with fresh ties and ballast in various locations. This spot near the Robert’s Mill foundation shows a mix of old and new. This right-of-way is well over a 150 years old and only maintained as needed due to the low volume of traffic. Fresh ballast is simply applied on top rather than having the old material dug out and removed. With this and the encroaching vegetation, the track is merging with the landscape. 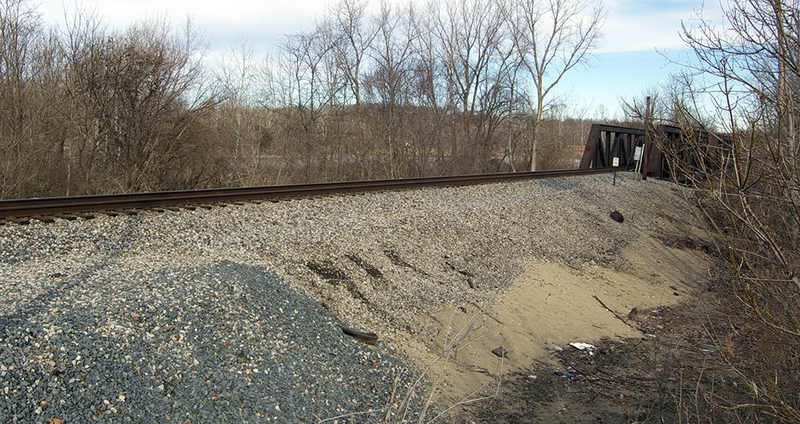 Near the enginehouse at Brookville, there is evidence of fresh ballast and new ties on the two storage tracks in the upper left. The two piles of blue-gray material is spillage of roofing granules from covered hoppers. To the right, the running tracks are buried in a mix of oil soaked dirt and ancient ballast. A turnout and track to the second enginehouse stall were removed from the middle track, leaving the old ties in place as a cost saving measure. There is so much character to model here, one could study this photo for hours. What ballast? This track hasn’t been touched in years and, yes, it was/is active. Our traditions shy away from modeling a surface like this out of fear for the electrical issues and running qualities. It’s a judgement call for the modeler but I suggest there is little to fear. I have piled up ballast and other materials on my track in HO and quarter-inch scales and had good operation. Common sense is an excellent guide and as long as the rails are clean in the contact areas and wheels and other moving parts like switchpoints are free from obstruction, you’re good to go. It goes without saying that these effects are applicable to commercial or handlaid track in any scale. It’s tired but sound advice to practice on scrap pieces of track until you’re confident with the techniques involved. That said, this series is short on specific techniques because those techniques are well known and widely available. Like my other writings, the emphasis is learning to see such conditions and understanding how to break them down for modeling. It’s about being thoughtful toward your craft regardless of the materials used. My book, Detailing Track covers ballasting and other aspects of track modeling in greater detail. You can find it here. Part Three looks at color.